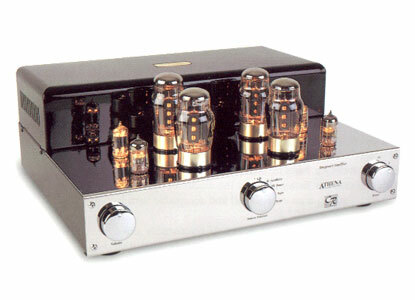 New to the CR amplifier range, Athena destroys any pre-conceptions about limited dynamics of tube amplifiers. With a sparkling sound quality and the ability to successfully drive almost any loudspeaker, Athena will satisfy the most ardent critic of tube amplifiers! The all-valve circuitry, including the phono input stage, gives a warm yet dynamic sound that will make you want to listen to all your records and CD’s again. The low noise phono input circuitry offers high clarity reproduction from vinyl records, giving the exceptional listening experience only found with an all-analogue system. The amplifier is a completely integrated product with a total of five inputs. Four for line level sources as well as a phono input for turntables using moving magnet cartridges. The output stage uses a balanced push pull circuit, operating in “Class A” at low levels, swinging to “Class AB” for higher power and dynamics. The conservatively rated 6550 output tubes are auto-biased making tube replacement an easy process. The classic output design combination from CR ensures perfect linearity, reducing harmonic and intermodulation distortion to a minimum. Athena will combine well with most quality sound sources and, as mentioned above, will provide enough power to drive even low sensitivity loudspeakers.